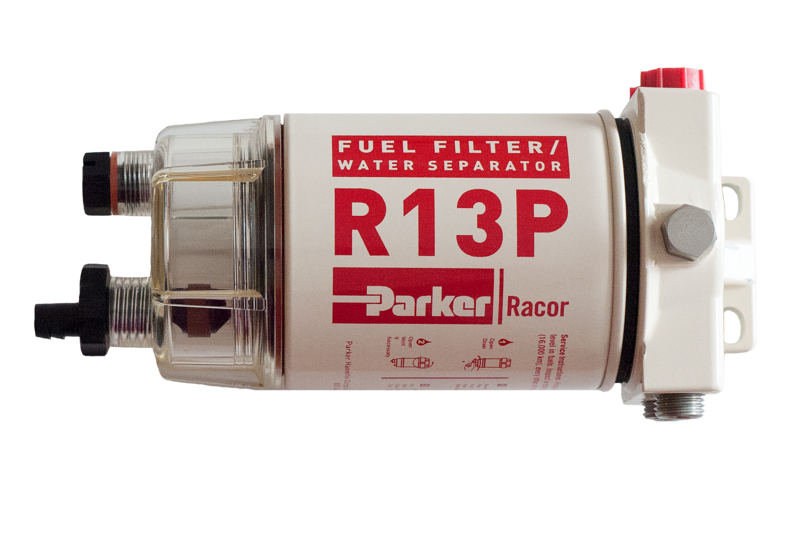 The Racor 120 Series features a two compact sizes to fit the most cramped engine compartments. Both units feature 1/4”-18 NPTF inlet and outlet fuel ports and a unitized mounting bracket. Both 120 Series assemblies feature spin-on, high-capacity, Aquabloc®II replaceable filter elements which stop water, remove solid contamination, and are available in 2, 10, and 30 micron. Filtration needs should be based on application, fuel quality, operating climates, and maintenance schedules. Both units feature spin-on contaminant collection bowls. The clear bowls used with these models will not discolor from alcohol, additives, or UV light and have a leak-proof, positive seal drain for easy servicing. Water and contamination levels can be seen easily at a glance. 120 Series optional accessories include: water detection kits, vacuum or compound gauges and metal bowls. Metal bowls should be specified when filtering fuels in hazardous locations where equipment is exposed to flying gravel and debris.